ABMP is excited to announce the acquisition of the World Massage Conference Vault, featuring more than 400 on-demand continuing education classes for massage therapists and bodyworkers. ABMP members have already enjoyed free continuing education as part of their membership—more than any other organization or membership association. 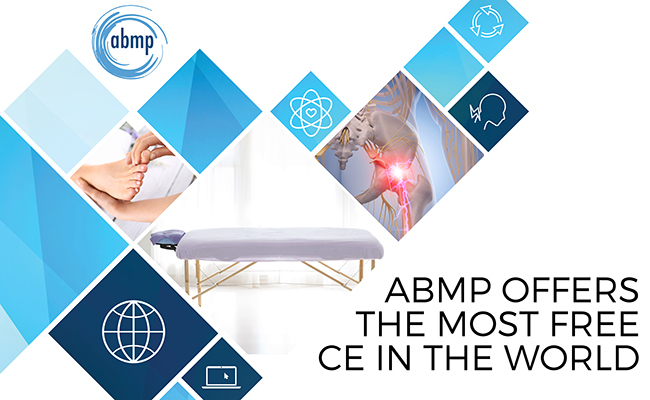 Now, by combining more than 200 hours in the ABMP Education Center with the World Massage Conference Vault, ABMP Certified members will have access to more than 600 on-demand CE courses—the most online massage and bodywork CE in the world! ABMP Certified membership also includes professional liability insurance, 50+ exclusive ABMP discounts, the award-winning Massage & Bodywork magazine, practice-building help, and much, much more. Are you interested in ABMP’s quality Continuing Education and a portfolio of additional outstanding resources, but you don’t need or want liability insurance? ABMP Associate membership is for you! Including all of the 200+ courses in the ABMP Education Center plus the 400+ courses in the World Massage Conference Vault, ABMP Associate membership is a great choice for massage therapists and bodyworkers outside the United States and for individuals in professions related to bodywork. To simply gain access to the 400+ courses in the World Massage Conference Vault for one year, you can purchase a subscription. This option allows you to watch all courses on-demand and earn NCBTMB-approved CE. Already have an ABMP account? Purchase the Vault now for $169! New to ABMP? Setup an account and purchase the Vault for $169!